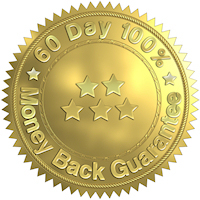 Click here to read our Forever Lifetime Warranty and our 60 Day 100% Money Back Return Policy. 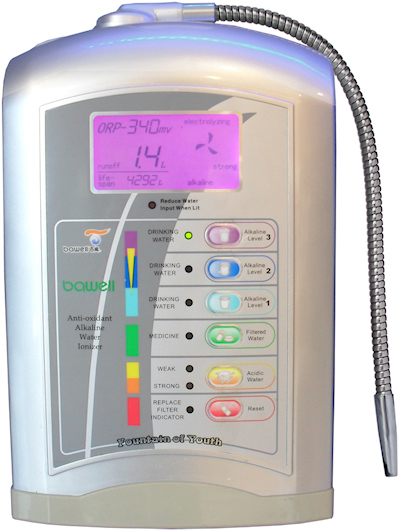 Now you can see for yourself the difference between drinking alkaline ionized water from your water ionizer machine compared to ordinary filtered or alkaline bottled water. Take the Bawell Challenge and experience all the health benefits with a Risk Free 60-Day 100% Money Back Guarantee on one of our amazing alkaline water machines. We challenge you to invest in your health and find out first hand why Bawell systems embody the best quality and value in ionization technology. Your Bawell system will be shipped within one to two business days from the date of your purchase. You won't have to wait long to start enjoying these ionized alkaline drinking water health benefits. Orders shipped to Canada are Duty Free. Bawell pays any customs fee, the price is as shown on our website in USD. 1. Click the FINANCING LINK HERE then add the item to the shopping cart. 2. In the shopping cart click on "Apply Now" for no interest special financing, as shown in the image below. See how water ionizers with a single filter and a transformer look on the inside in this disassembly video. Bonus Sale includes 2 extra free internal filters and 1 free external 3 stage pre-filtration system. These are in addition to the 2 filters which come with the machine. Dual internal filtration system (filters included) with optional external 3 stage filtration. 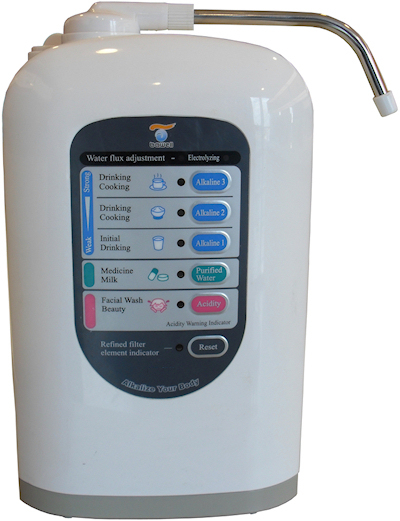 Superior water filtration system compared to all other ionizers. Universal Faucet adaptor fits "pull out" or "sprayer" style faucet heads in addition to standard & older faucet designs. Connect directly to kitchen or bathroom faucet and place machine on countertop or connect directly to water line below sink and place machine on countertop. Faucet and water line adaptors included. Dimensions in Inches: Length: 11.8" Height: 15.2" Width: 6.2"
Built-in Compartment for adding vitamins or minerals in solid or liquid form. Built In LCD Screen displays PH, ORP, Flow Rate, Filter Life, Temperature, Alkalinity level, Acidity level, and other variables. Electrolysis Chamber: 5 Medical Grade Platinum Coated Solid Titanium Plates with a total surface area of 528 square cm. Included Internal Filter good for 6000 liters or 1585 gallons filtered water. Drinking 4 gallons per day filter will last 1 year. Produces 5 Water Level variants. Electrolysis Chamber: 3 Medical Grade Platinum Coated Solid Titanium Plates with a total surface area of 264 square cm. 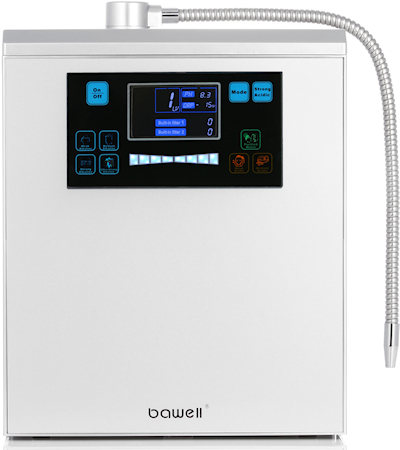 Bawell Ionized Alkaline Water Machines come with a universal faucet adaptor which will allow you to connect the machine to any kitchen or bathroom faucet. To make this connection, you must have a removable aerator on your kitchen or bathroom faucet. The aerator is the part on the tip of your faucet with the screen, where the water comes out. You can see it at the 26 second mark in our installation video below. In the video, you can see some different kitchen faucet designs and the process of removing the aerator from the faucet and then screwing in our adaptor. In order to connect the machine to your kitchen faucet, you must have a removable aerator. If your faucet does not have a removable aerator, you can connect the Platinum model 2195 and Fountain model 1775 to the cold water line below your sink. You will then need to run a small 1/4" diameter tube through your counter top to the bottom of the machine. This tube will deliver water into the machine, allowing you to skip the faucet connection. You can run the tube through a soap dispenser hole or some other pre-drilled hole in your counter top. Some people do not want anything attached to their kitchen faucet, so they can connect the machine below their sink in this way. In both installation examples, you must place the machine itself on the counter top next to the faucet, as seen in the last 2 minutes of the video below. Bawell alkalized water systems are for the counter top only, you cannot place them under the sink. You may make all the connections below the sink, but you must place the alkaline water ionizer system on the counter top. You may also hang your Bawell system on the wall, all of the models have wall hanging grooves in the back of the unit for those people that want to hang it up above the sink on the wall. While you can connect the Platinum and Fountain models to the faucet or to the water line below the sink, the Premier and Electrolyte models can only be connected to the kitchen faucet. 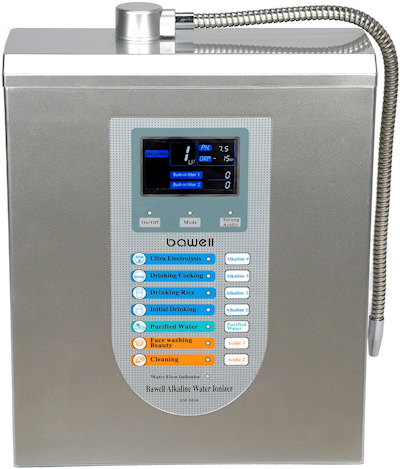 Bawell models can even be used with reverse osmosis systems or any other water purification system that may be currently installed in your home. The faucet adaptor which comes with our water alkalizer systems has multiple attachments to increase or decrease its size for different kitchen faucet designs. Copyright of Bawell All rights reserved.